Every graduate of Inspire Hypnosis Advanced Course receives the above certificate of completion. After completing the Basic Course in hypnosis training, the Advanced Course is a natural progression in mastering the artistry of hypnosis. You learn advanced verbal and non-verbal communication skills. Cutting edge hypno-phenomena, strategies and suggestions for the most difficult problems a professional hypnotist may encounter. Learn the secrets of mass influence, hypno-change drama techniques. MHS's exclusive entertainment hypnosis sequence is revealed to Advanced students. 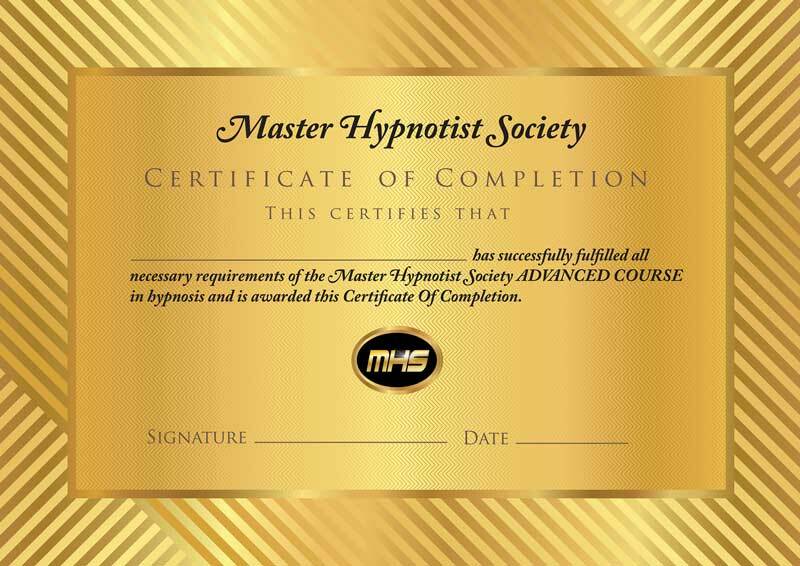 You become proficient in all skills as you are instructed by a MHS certified Master Hypnotist. Compare our training in hypnosis to what's available and you will agree, MHS's Professional Hypnosis Training is the best investment you can make. For scheduling requirements, necessary time for completion and other information about the Advanced Professional Hypnosis Training, call me, Marge Perry, at Inspire Hypnosis. I answer any question you may have. Call now (530) 387-6644. "If you are considering investing in training as a professional hypnotist, marge Perry is uniquely qualified to deliver the type of hypnosis education, training and back end support you want, need and deserve. Marge is at the top of the hypnosis trainer list. She's really that good."